On a July morning in 101 bc, Roman commanders Marius and Catulus assembled their armies on the plains below the Italian Alps. They were all that stood between Rome and the fierce tribesmen from the north. In 102 bc, a disturbing report circulated through Rome that the people they called Cimbri and Teutones had crossed the Alps. Neither the towering mountains nor the ice and snow had stopped these much-feared barbarians from the north, despite their alleged nakedness. Indeed, it was said that they had used their great curved shields as sleds to slide down the frigid valleys into the grassy plains of Cisalpine Gaul below. The report was only partly true, but the Romans had good reason to be concerned. For more than a decade, the generals they sent against the Cimbri had seriously and consistently underestimated their northern adversaries. Roman forces twice had been completely wiped out. The most devastating defeat occurred on October 6, 105 bc, at a place called Arausio, where Rome suffered its single greatest military defeat. Some 300,000 massed Cimbri and Teutones annihilated 80,000 Roman troops led by Quintus Servilius Caepio and Cnaeus Mallius Maximus. Rome’s defeat that day was on par with the crushing defeat at Cannae (216 bc) and more devastating than Carrhae (53 bc). Legion after legion had been destroyed by the Germano-Celtic alliance. The need to replace such large numbers of men so quickly put the Roman commonwealth under great stress and threatened to bring it down. The cycle of disaster was finally broken by an ambitious politician from Arpinum, a small backwater hill town 70 miles southeast of Rome. His name was Caius Marius. He was a so-called “new man,” a citizen without the prestige born of an ancient family of Rome. In the fiercely competitive political system of Rome, which championed tradition over innovation, men advanced to the highest offices of government by winning the hearts and minds of voters through their performance in the courthouses and on the battlefield. There, in pursuit of glory, a man could demonstrate his courage and nobility in the face of great personal risk. Marius had established his credentials as a warrior over three decades of conflicts in Spain and North Africa, where he had finally defeated the usurper king of Numidia, Jugurtha, in 105 bc. He had worked his way up the political career ladder from the lowest magistracy to the consulship—not once but four times. It was the consuls, two of whom were elected each year, who led Rome’s legions of citizen soldiers against its enemies. As consul, the 55-year-old Marius engaged a massive combined army of Ambrones and Teutones, allies of the Cimbri, beyond the Italian Alps at Aquae Sextiae (Aix-en-Provence) in 102 bc. From a nondescript hilltop in southern Gaul, Marius and his small force of Roman infantry and Ligurian cavalry had faced tremendous odds to defeat a much larger force. Estimates of casualties that day were a staggering 200,000 enemy killed and 90,000 captured. Among the captives was the king of the Ambrones, Teutobod. The bodies of the fallen were left unburied on the ground. Thousands of tribal women, who had also fought the Romans and been taken prisoner, committed mass suicide in a last desperate act of protest, giving birth to the legend of Germanic heroism. The victory, grim as it was, had been crucial in raising Roman morale and giving Rome and its allies time to regroup. Despite Marius’s victory at Aquae Sextiae, another migration of Cimbri had crossed unopposed over the central region of the Alps via the Reschen, or Brenner, Passes. The Cimbri continued on their way, following the course of the Adige River to the Tridentine heights on the Italian side of the Alps. Hoping to block their advance, Marius’s fellow consul, Quintus Lutatius Catulus, moved to intercept them. A member of the prestigious Lutatia clan, 48-year-old Catulus was a wealthy and cultured man known for his prowess in oratory, prose, and poetry, but like all aristocrats of his age, he was expected to perform his duty and lead his countrymen in war. Arriving in the region north of the Po River, Catulus quickly established a fortified position on the Adige, over which he built a bridge to support the forward shock troops and provide them with an escape route if necessary. Seeing the Romans’ defensive installations, the Cimbri responded by ripping up trees and floating them downriver into the bridge’s piers, almost destroying it. Concerned for the safety of his men, Catulus called for an orderly evacuation. Meanwhile, the invaders surrounded the fort but, respecting their adversaries’ courage, showed mercy and let them depart unharmed. The Cimbri then settled in large numbers on the plains below the Italian Alps in the region the Romans called Cisalpine Gaul. With this buffer territory lost, there was a very real possibility that the Cimbri could invade the Italian Peninsula and that Rome itself could be attacked. The fate of the city still hung in the balance. The only way to be sure was for the Romans to engage the invaders in pitched battle at a time and place of their choosing. The Cimbri first entered written history in 113 bc, but their origin is obscure. Plutarch argued that they were Germanic, while other contemporaries proposed that they were Gallic or Scythian. Recent DNA studies suggest that Celts from the Marne region of Gaul immigrated to Northern Jutland in Denmark around 400 bc. The Cimbri may actually have been a confederation of smaller warrior bands retaining their tribal chieftains. From 120 bc onward, between 200,000 and 300,000 Cimbri migrated south and wandered around Western Europe in search of a new homeland. They eventually arrived in the Alps in the Carinthia region of Austria, already occupied by the Norici people, and went farther southeast to where the Taurisci nation lived. The Cimbri settled around Veneto. The Taurisci, treaty-bound allies of Rome, sent warnings of the arrival of the Cimbri in northern Italy. 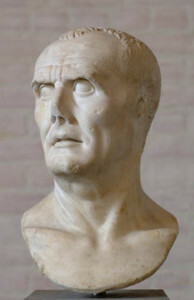 In 113 bc, Consul Caius Papirius Carbo was dispatched by the Senate to investigate the potential threat. Rather than first assessing the situation, he immediately took up a defensive posture. The Cimbri hastily sent emissaries offering apologies for entering Taurisci land without invitation. Carbo did not believe a word of their explanation. Eager for the political capital a solid victory would bring, Carbo spoiled for a fight. He marched his army out of camp and ambushed the Cimbri at Noreia, in eastern Austria. The consul soon discovered that the Cimbri were more than a match for him and his men. These were not the naked savages of popular reports, but instead well-equipped, battle-hardened warriors who wore helmets that resembled the open mouths of frightful beasts with strange-shaped heads surmounted by lofty crests of feathers, which made them appear taller. They also wore iron breastplates and carried glittering white shields. They were an organized fighting force, not a disorganized rabble. Carbo’s army was utterly destroyed in an ambush. 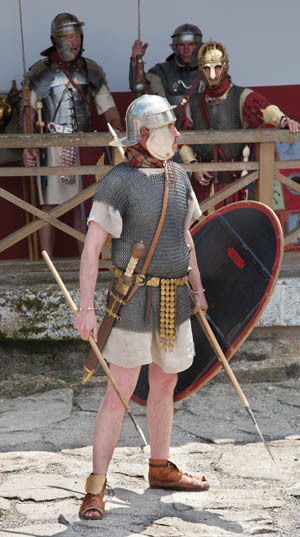 A Roman reenactor wearing chain mail, armed with a gladius sword and pilum javelins. Like most Celtic societies of the time, the Cimbri were led by a war chief; the current chief was named Boiorix. Below the war chief was a class of nobles, personal retainers, and freemen. Beneath them was a great number of disenfranchised common folk who could be called upon to fight whenever asked by their leaders. The Cimbri’s allies, the Teutones, despite their name, were actually Celtic rather than Germanic. Why they migrated from their homeland in the north is unclear. In the face of the mounting threat, Marius was sworn in as consul on January 1, 101 bc. It was his fifth time to serve in the highest magistracy of the republic. The Senate looked to him to lead Rome’s preemptive strike against the invaders from the north, who now threatened the nation’s security. A consul was normally placed in charge of two legions, giving him enough troops to deal with most military challenges but not so many that he could pose a risk to the state. Knowing how large an enemy he faced, however, Marius demanded more men. He was joined by additional legions under the command of Catulus, his co-consul of the previous year. The two men marched off with their legions, gathering others recruited from their Italian allies en route, finally arriving in the foothills of the Alps, where they established temporary camps and waited for the enemy to show themselves. The prelude to the battle was a surprisingly civilized affair, with negotiations taking place between the commanders of the two opposing sides. Boiorix and his bodyguard rode up to the gate of Marius’s camp under a flag of truce and demanded to know when and where they would fight to settle the claim to the land both now occupied. Marius replied contemptuously that Romans never took advice from their enemies as to fighting. Nevertheless, he said he would gratify their request for a fair fight and agreed to meet them three days later on the plain of Vercellae, a place, he said, that would suit his cavalry and also allow space for the Cimbri to deploy their vast numbers. Although vastly outnumbered, Marius’s Roman army defeated a combined force of Ambrones and Tuetones at the Battle of Aquae Sextiae, near present-day Aix-en-Provence, in 102 bc. An original gladius blade with reproduction hilt. Marius had chosen the time of day well. The bright sun was shining full in the faces of the Cimbri. Prisoners rounded up after the battle told of how “heaven seemed to be on fire from the glittering of the Roman helmets and the reflection of the sun’s rays from them.” The Romans formed on the eastern side of the plain, with Catulus’s men in the center. Marius divided his force in two, placing one on each flank. The 37-year-old Lucius Cornelius Sulla, who had served earlier under Marius as military tribune, now commanded a legion under Catulus. Marius was keen to bear the brunt of the enemy attack in order to claim the glory entirely for himself and his troops. With the majestic Alps showing above the haze on the horizon, Marius surveyed the open plain of the battlefield. As far as his eyes could see the forces of the barbarous army of the north were hurriedly assembling. The northern alliance faced a combined Roman force numbering about 55,000 men. Marius fielded 32,000 troops, while Catulus brought 22,300. The Romans were outnumbered more than three to one, and the northern tribesmen already had beaten them more times in a straight fight than they had defeated the invaders. Together, the Cimbri and Teutones fielded an army of between 180,000 and 200,000 (including women and children), of which 15,000 were cavalry. Despite the prior agreement on time and place, the Celts were not ready that morning. They were unprepared for battle and fell into disorder when they saw the Roman ranks forming up in the distance. They left their families behind with the wagons and baggage and formed up in front. Their cavalry took the lead and opened the battle with a charge directly at the Roman center. As the Cimbri approached, their riders steered their horses to the right. It was a feint designed to draw the Roman shock troops away. Catulus’s men took the bait. Someone in the Roman ranks cried out that the enemy was fleeing; others took up the cry. The normal discipline of the legionaries broke down and, despite their officers’ attempts to stop them, the men charged off in eager pursuit. Behind the cavalry, the heavily armed Cimbri infantry now began a slow and steady march forward in a dense square formation some 18,750 feet across. Once in range of the Roman lines, they unleashed their razor-sharp darts. Each man carried two darts, and the ensuing rain of missiles was potentially devastating. When they had exhausted their ammunition, the Cimbri unsheathed their long swords, which they wielded as slashing weapons. It was a remarkably similar combat doctrine to the Romans’ own. Marius was prepared. Understanding his adversary’s mode of fighting had given him the advantage he needed to defeat his foes at Aquae Sextiae. With the Cimbri equipped similarly to his own troops and being greater in numbers, Marius knew that he had to beat them through superior strategy and disciplined execution on the ground. His plan was to execute the same tactics that Hannibal Barca had employed with such devastating effect at Cannae, deploying his flanking infantry and cavalry with instructions to envelop their foes. An unexpected distraction arose. As Marius’s men raced forward to engage the Cimbri, a great cloud of dust swept up, caused by the wind and the movement of troops, shrouding the two opposing forces. Unable to see through the cloud but continuing their charge, Marius’s men could not see that they were actually running alongside the Cimbri in the opposite direction. The front line of the Celtic square fell upon the legions under the command of Catulus. The dust storm, however, turned to the Romans’ advantage by obscuring the great number of the Cimbri. Unable to see exactly how many troops they faced, the Romans raced on enthusiastically. 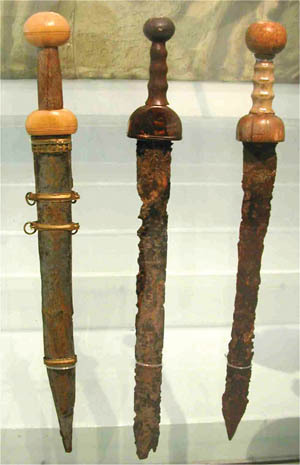 The Roman soldier’s missile of choice was the short spear called the pilum, launched in volleys before charging forward with shield raised and carrying a short, bayonet-like stabbing sword, the gladius. 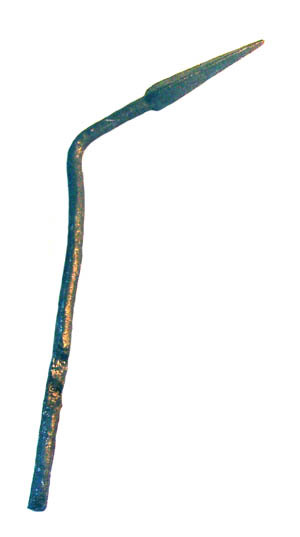 An original Roman spearhead, apparently bent from combat. Eventually, the wind died down and the fog evaporated. The sun now shone directly into the eyes of the northern warriors and sparkled on their opponents’ polished helmets, blinding them. The Roman counterattack gained ground, and the northern troops began to falter, their moves hampered by their own measures to enforce discipline in their ranks. The Cimbri were reportedly joined together by long chains fastened around their waists. As their men were cut down by the shower of Roman pila and the stabbing of their short swords, those still living were unable to break free. It quickly turned into a bloody massacre. The Cimbri cavalry was driven back into the lines of its own infantry. In the confusion, horses trampled many of the foot soldiers. 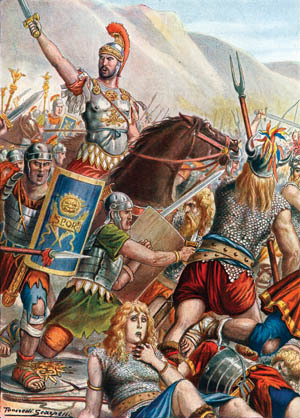 The Cimbri infantry, however, still pressed on gallantly. Boiorix himself fought furiously before being mortally wounded. The Romans now had momentum and shoved their opponents back. Sensing defeat, the Cimbri turned and retreated, but their withdrawal was blocked by the lines of wagons parked behind them, upon which stood their families. They had been watching the battle unfold before them and were armed with axes and pikes ready to defend the baggage if the need arose. The women cried out for their men to continue the fight. Those who refused were struck down by the pitiless women, regardless of whether they were their husbands, brothers, or fathers. Rather than allowing their children to fall into enemy hands, the mothers strangled them or threw them under the wheels of the wagons or beneath the hooves of their beasts of burden. The battle on the Raudine Plain was over; victory was claimed by the Romans. The numbers recorded for those killed or captured vary widely, with some Roman historians placing the Cimbrian casualties as high as 160,000 killed and 60,000 captured. Fewer than 300 Romans were acknowledged to have been killed. After the battle, the victorious Roman troops were allowed to pick over the battlefield and wagon train to take the enemy’s spoils and booty. Particularly prized were the battle standards. Thirty-three military standards of the Cimbri were recovered, two by Marius and 31 by Catulus. On the basis of the sheer number of captured flags, Catulus claimed the glory of the victory. Marius’s men disputed the claim, and scuffles broke out among the rival Roman troops. To arbitrate between the two bickering sides, ambassadors from the free city of Parma were called in. They went out on to the battlefield and studied the strewn bodies of the fallen Celts. Catulus’s men had carved their commander’s name into the shafts of their pila, and they were able to point to weapons that still pierced the corpses. 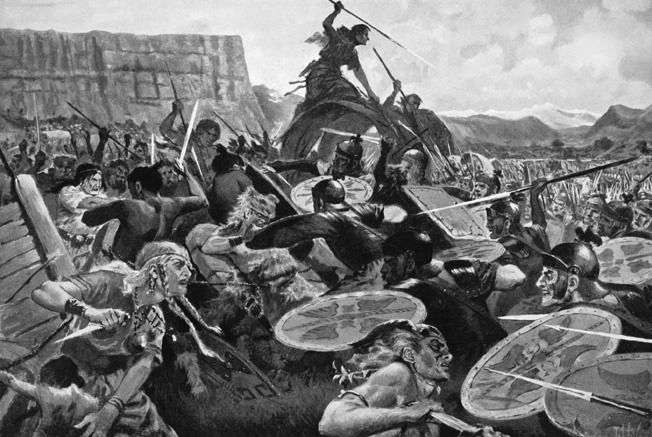 As Marius and his Romans overran the Cimbri, the tribe’s women, shown at bottom, rushed to join the fray. Many strangled their own children to prevent them from falling into Roman hands. Winning the battle, of course, had been a team effort, but the credit for it nevertheless went to one man. Taking into account his previous victories and his political stature, Marius was declared the victor at Vercellae. The Roman people acclaimed him “the third founder of Rome” for saving their city and included prayers to him in public and private religious rites. They urged that he alone should be granted the right to celebrate not one, but two triumphs. There were vociferous protests before a compromise was reached. It was proposed that Marius should share his triumph with Catulus. Marius magnanimously agreed. The battle on the plain beneath the Alps marked a turning point in Marius’s illustrious career. Recognizing the contribution of the Italian allies, but without first seeking the consent of the Senate, Marius granted them the full rights of Roman citizenship. Until Vercellae, Rome’s Italian allies had been considered as second class to its own citizens. Marius argued that on the battlefield he could not distinguish between Romans or allies. Now they would serve with the Roman legions without discrimination and be treated as equals. It might have been the right thing to do, but Marius went about it in the wrong way. By not first consulting the Senate, he had snubbed the ancient institution and acted unilaterally in the manner of a dictator or a king. It was the first time an elected senior official had openly defied the political leaders, and it set a terrible precedent. The inviolate sanctity of the relationship between the Senate and the people, consuls and army, had been irrevocably challenged. In 91 bc, Romans fell out with their Italian allies over the issue of citizenship rights and equal treatment before the courts in Rome, and the disagreement led to bloodshed. Marius was given command of Roman forces in the resulting War of the Allies, or Social War, but fearing that he would grow too powerful, senators persuaded him to relinquish command. Sulla took over leadership of the war and saw it through to its conclusion in 88 bc. A new threat, meanwhile, had emerged when Mithridates VI of Pontus began to make claims on Rome’s dominions in Asia and Greece, even going so far as sending ambassadors to the Cimbri to request military assistance. Rome’s response to the threat split along class lines. The Popular Assembly voted for Marius to lead the war against Mithridates, but the Senate supported Sulla. For his part, Sulla refused to accept the validity of the popular vote. Civil war ensued. Catulus joined forces with Sulla, whose army marched on Rome—the first time in the history of the Republic that a Roman general had marched on the city. Once in control, Sulla declared Marius an enemy of the state and forced him into exile. Sulla then left Rome to fight the war in the East. Aided by Lucius Cornelius Cinna, Marius plotted his return from Africa, and in 87 bc he returned to Rome at the head of his army. He immediately banished Sulla in absentia and repealed his regressive laws. A case against Catulus was brought by Marius’s nephew, but rather than accept the inevitable humiliation of a guilty verdict Catulus committed suicide. Marius himself died a few months later, apparently of natural causes, leaving Cinna to rule Rome alone. Returning from the East in late 82 bc, Sulla reentered Rome under force of arms, whereupon the Senate granted him emergency powers as dictator. After instituting a number of far-reaching constitutional reforms, Sulla surprised everyone by resigning within a year and retiring to write his memoirs. He died at age 60 from liver failure or a ruptured gastric ulcer in 78 bc, the last of the great Roman generals who had fought and won the epoch-making victory alongside Marius in the thick fog at Vercellae. Tags Alps, Ancient Greece/Roman Empire, Battle of Cannae, Battle of Carrhae, Boiorix, Caius Marius, Celtic warriors, Celts, Cimbri, General Lucius Cornelius Sulla, gladius sword, Mithridates VI of Pontus, Quintus Lutatius Catulus, roman empire, roman legion, Roman Pilum Spear, Rome, Teutones.